Two of America’s most populous states, Texas and Florida, are in hurricane ruins, and Washington is fomenting more wars. The US national debt is now over $20 trillion, and Washington is fomenting more wars. The entire world is helping Washington foment wars – including two targeted countries themselves – Russia and China – both of which are helping Washington foment more wars. Believe it or not, both Russia and China voted with Washington on the UN Security Council to impose more and harsher sanctions on North Korea, a country guilty of nothing but a desire to have the means to protect itself from the US and not become yet another Washington victim like Afghanistan, Iraq, Libya, Somalia, Yemen, Syria, Serbia, and Ukraine overthrown in a US coup and now poverty-stricken. I once thought that Russia and China were checks on Washington’s unilateralism, but apparently not. Both governments have been knuckled under by Washington and both voted to punish North Korea for striving to be sufficiently armed to protect its sovereignty from Washington. 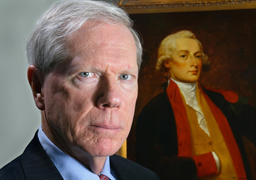 This post was published at Paul Craig Roberts on September 12, 2017.